These two west side Chiricahua trails (Morse Canyon Trail #43 & Pole Bridge Trail #264) lead from the road up West Turkey Creek Canyon into the high country to the south of the canyon. Tall peaks dominate the view as you drive up-canyon to these two trailheads. Both trails follow pine needle-carpeted pathways through forests made up of a variety of tree species. Among the trees you will see along this trail are Apache, ponderosa and Chihuahua pine, Douglas-fir and Gambel oak. The Gambel oak and high country aspens provide a touch of color in fall. Morse Canyon Trail is one of the main access routes to the summit of Monte Vista Peak. This 9,357 foot peak boasts some of the best views in the Chiricahuas. Pole Bridge Trail winds through the Pole Bridge Research Natural Area before switchbacking its way to higher ground. Views from the trails include overlooks, through the trees, of broad West Turkey Creek Canyon as it slopes toward the Sulphur Springs Valley. An 8-mile loop is possible along a route that includes both of these trails, a one half mile connecting section of Turtle Mountain Trail #219 and about a mile and a half of Forest Road 41 (the access road to both trailheads). A trip via the Morse Canyon Trail to Monte Vista Peak is about 8 miles round trip. 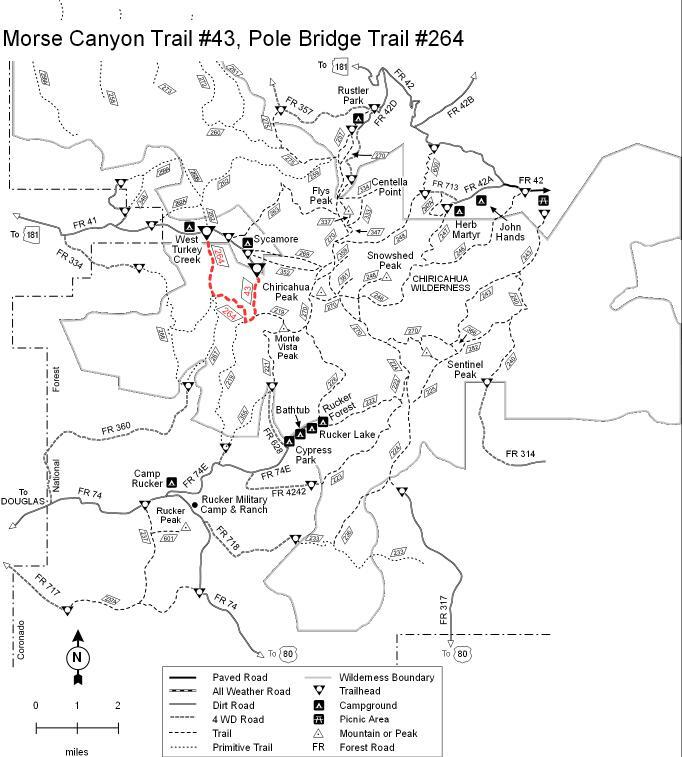 Other popular loop routes from Morse Canyon include part of the Crest Trail #270 and Mormon Canyon #352 or Mormon Ridge #269 trails for an even longer day. From Tucson, take I-10 east for 72 miles to US 191 then turn south and continue for 21 miles. Turn left (east) on AZ 181 and drive 12 miles to the Turkey Creek turnoff (Forest Road 41) then follow this road east 9.8 miles to the Pole Bridge Trailhead, 11 miles to the Morse Canyon Trailhead. These roads are rough and dusty and may be muddy and slick when wet. There is a flash flood danger at water crossings following summer and winter storms.